Extreme snowboarding occurs at lucky resorts that have the terrain for it and on distant mountains with steep open terrain, shoots, rocks, cornices, variable snow and natural and man made obstacles. Extreme riding is basically done by riders that just love that high alpine environment. Like the name high alpine, some riders actually do use a more Alpine Type of Set-Up in these conditions. The increased edging capabilities of a hard shell setup are attractive to many extreme riders. However, most riders will still use a more free ride type of set up. A backpack – to carry lunch, a shovel for digging out an avalanche pit or lunch table, backup goggles, gloves and tools. Snow Shoes – Much of this type of terrain is only accessible by foot, snowmobile or helicopter. An Yoda once said, “Surprisingly easy it is to get there by snowshoes”. Don’t be afraid of the work. It makes the run that much more worth it. Any extreme type rider must get a Pieps, an Orthovox or some other kind of Avalanche Transceiver. They can save your life or that of your friends. Believe it. 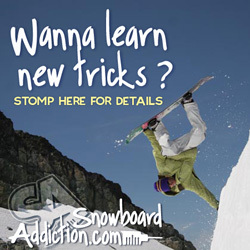 If your getting into Extreme Snowboarding, you must have one and know how to use it. Good board control and experience. Don’t be scared of the steeps. Practice them and love them. Enjoy the rush of gravity and the thrill of feeling on the edge of control. Thinking about it now, I am sorry I haven’t ridden much steep stuff lately. Boy, I used to though. Dropping cliffs, slashing steep powder faces, etc…. Whether Freeride or Alpine setup this kind of riding is usually done with more forward and aggressive angles that other freestyle types of riding. That and the terrain, sets up a certain kind of style that is clearly unique. These riders use more technical clothing along with their more technical and specialized technique. They put more importance on warmth and storm preparedness. Rightfully so, they ride the top of the mountain. So the clothing and personal style here is more like mountaineering than any other part of Snowboardings’ many faces.